For residential comfort and easy towability, nothing beats an Cherokee Destination Trailer by Forest River RV. Elegantly furnished and engineered with the durability to take on any adventure, this impressive lineup is a force to be reckoned with. Spacious and well-appointed, this comfortable lineup features an absolutely stunning living space with all the practicality of home. 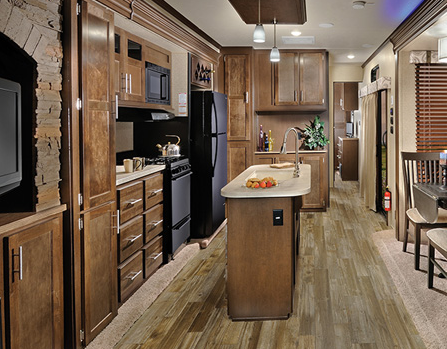 Available in a choice of floorplans and outfitted with plush residential furnishings, a Cherokee Destination Trailer is unsurpassed in its liviability. Beautifully framed with Shaker style cabinetry, the galley is an attractive space perfect for relaxation. And thanks to its durable linoleum and polypropylene stain resistant carpeting, this is a space made for living. No worries about rough-and-tumble kids playing, no fretting about wear after a day at the lake…a Cherokee Destination Trailer is made for getting out and enjoying life. Constructed on a powder coated, rust resistant frame, the Cherokee Destination Trailer has the ability to withstand any road ahead. Equipped with added features like safety glass windows, CO2 detector, and fire extinguisher, the Cherokee Destination Trailer gives travelers a little extra peace of mind. And with its R7 fiberglass insulation, RVers can travel safely more days of the year. Convenience, comfort, and cutting-edge engineering — this is what makes a Cherokee Destination Trailer a leader in the industry. And with a name like Forest River RV behind it, you know you’re traveling in more than just a durable destination trailer, you’re traveling with a team dedicated to making sure your travel experience is time well spent. For more information on this superior destination trailer, and to see a range of models for yourself, visit our Duluth, MN location today!